It’s that time of year again. Tonight is opening night for the Mandell JCC’s Hartford Jewish Film Fest! As usual, I’d love to see some familiar faces in the crowd. You don’t need to be Jewish to attend! There’s a little something for everyone, and they are all worth viewing. Learn more about each of these films (and others – I left a few out), along with location information, on the film fest site (for the budget-conscious, I have not included opening and closing night in this list, but they’re worth seeing, too). While I mentioned above that I was not including it, I have to say that I am incredibly excited to see the preview of Trinity College History Professor Sam Kassow‘s Who Will Write Our History following The Last Mentsch on closing night. I recently read the book and was amazed by the work of Emanuel Ringelblum and the Oyneg Shabes Archive. Published on March 16, 2014 March 16, 2014 by Jennifer S.
We are four days away from the opening of the 18th annual Hartford Jewish Film Festival. It is once again a great selection of films, and I hope to see many of you there. Every one of us on the film fest committee has our favorites. I have managed to narrow my list down to five full length films, and one short. Susan Dunne of the Hartford Courant has written about a couple more that are also quite worthy, including 50 Children – The Rescue Mission of Mr. and Mrs. Kraus and Next Year Jerusalem. Visit the Festival web site for information about showtimes, costs, and more complete descriptions. The links below will take you to each movie’s trailer. Judging by the ticket sales, one that is proving very popular is The Jewish Cardinal. This is the story of Jean-Marie Aaron Lustiger, Archbishop of Paris and the son of Polish-Jewish immigrants. There are many of us in the area who are interfaith, and it raises some interesting issues. Interested in photography? Life in Stills is for you. There are other twists and turns, as you might imagine with a family business, but this documentary focuses on a photography store that has been in business since the beginning of the modern Jewish state. It blends art, history, city planning, and more. Ordinarily I would not sit through a film described as a “gripping spy thriller.” But as those of us on the film fest committee screen all of the selections, I can now recommend Bethlehem. The ongoing conflict between Israelis and Palestinians is the focus, and the viewer gets a sense of the emotions on both sides. On the opposite end of the spectrum, if you are looking for something light and cheery with a happy ending, check out Cupcakes. It is a spoof on the Eurovision contest and just generally cute. Several of the films, including Cupcakes, are preceded by shorts. There will be four opportunities to see GentleDog. I’m not saying it’s worth buying a ticket just to see the short, but if you are choosing between a film that screens with GentleDog and one that doesn’t, go with the dog. Sometimes fiction strikes a nerve, and such was the case when Aftermath was released in Poland. It is not an easy film to watch, but the issues it raises are worth being aware of. If you have any questions, feel free to leave a comment. See you at the theater! Published on March 9, 2013 March 9, 2013 by Jennifer S.
It has been a few cold, snowy months since I last wrote about the Hartford Jewish Film Festival. With opening night on April 4, we are springing into action! The website is live, tickets are being sold, and apparently someone is even prepared to kosher-ize the popcorn machine at Spotlight Theatres (this announcement left most of the committee with puzzled looks on our faces and at least one of us heading to Google for an explanation). This week’s new and exciting announcement is the launch of our “Hava Hartford” Kickstarter campaign. Many of you have probably already seen my postings about this on Twitter and Facebook. For those who are unfamiliar, Kickstarter is an online fundraising tool that relies on crowdsourcing. Our goal for this project is $1000. We have to secure pledges of at least that amount before we will be awarded the money. With the contributions, we plan to exhibit a collection of Hava Nagila photographs, mostly collected from those who pledged to the campaign. Watch the video I made explaining it further! You don’t have to be Jewish to support the project! Any pledge amount is welcome. Supplying a photo is optional, though we certainly hope that if you have one, you will. When the exhibit is in place, you are all welcome to view it at the JCC. Please share the Kickstarter link with your friends and family! I truly enjoyed making the video, working with the JCC staff to get the project launched, and continue to enjoy being a part of the HJFF Committee. As I said in the video, thank you for your “uplifting” support! Where can you find a movie featuring Leonard Nimoy, Harry Belafonte and Regina Spektor*? 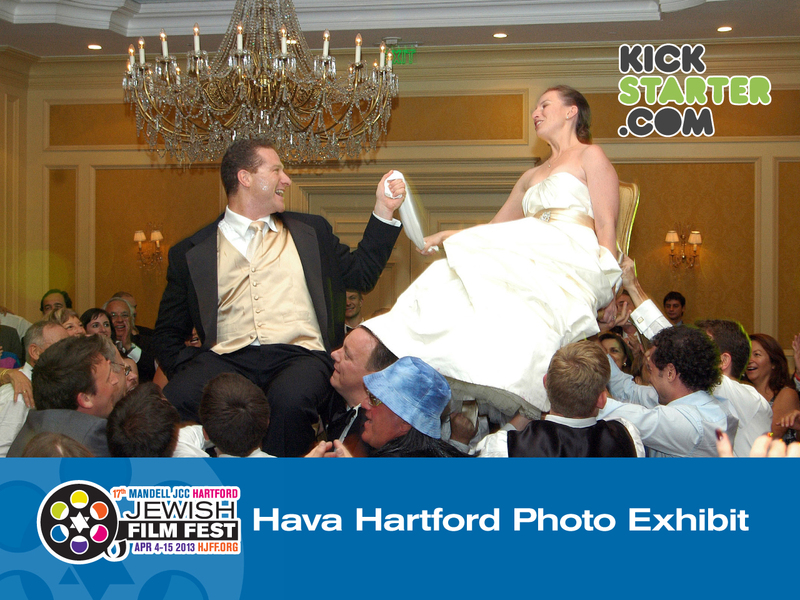 The Hartford Jewish Film Festival! As some of you know, I am currently on the committee for the Hartford Jewish Film Festival. In its 17th year, the festival is produced by the Mandell JCC of Greater Hartford. This year’s committee has been screening films since May (I joined in August) and has quite a line up planned for April. All of the films are award winners, premieres in this area, or both. Opening night will be held at the new Spotlight Theater in Hartford. Closing night will include a dance party at the JCC. Theaters in Bloomfield and West Hartford will host the nights in between. Among the titles I have enjoyed so far are a documentary about legendary New York Mayor Ed Koch (NYT article); Numbered, a documentary about Auschwitz numbers (NYT article); and The Day I Saw Your Heart (trailer), which has some lighthearted moments. As you might imagine, in order to pay for the films, theaters, etc., we need to raise some funds. Will you consider donating? Any amount is welcome, but in the Sponsorship Opportunities brochure you may read about perks for donating at certain levels. You don’t have to be in Connecticut or be Jewish to donate! Please consider a gift in honor of or in memory of someone, as well. Even if you are unable to give at this time, we hope you will be able to join us in the Hartford area, April 4-15, 2013. More information will be available in January, including on the HJFF website. If you leave a comment on this blog, I am also happy to answer any questions you may have. *Leonard Nimoy, Harry Belafonte, and Regina Spektor are featured in the closing night film, Hava Nagila (includes 10 min. clip).